Add a WORD RECOGNITION component to your TEST PREP work with your STRUGGLING DECODERS. Give your struggling readers practice recognizing some of the multisyllabic words they may encounter in testing situations. This fun BINGO ACTIVITY reinforces WORD RECOGNITION of 200 words struggling readers may encounter as they test. Easy to prepare, store and use, one-time prep BINGO CARDS can be placed in page protectors or be laminated for write-and-wipe play. PLEASE NOTE: ADDRESSES WORD RECOGNITION ONLY. DOES NOT ADDRESS WORD MEANING. SPECIFICALLY DESIGNED TO BE USED FOR SMALL-GROUP DECODING INTERVENTION. Complete Decoding Multisyllabic Words INTERVENTION BINDER - TEST PREP edition for STRUGGLING DECODERS. GUIDED PRACTICE WORK PAGES which help decoders look for word parts and small words they recognize in gigantic words. Progress-monitoring ASSESSMENT of included WORD PARTS and MULTISYLLABIC WORDS. Demonstrate and apply phonetic knowledge by DECODING WORDS using knowledge of PREFIXES and SUFFIXES. THIS IS A SINGLE COMPONENT OF THE "I CAN READ GIGANTIC WORDS" program. •This program is most useful for readers of any age who have achieved approximately second grade reading level. •These readers have mastered many sight words, but may not have mastered beginning phonics. •The lower the reading level, the more scaffolding and support will be required. •This program is valuable for many on-grade-level readers in 4th grade, as they begin to encounter many multisyllabic words in their reading. Familiarity with the individual parts of multisyllabic words is a crucial component of the advanced decoding ability necessary in the intermediate grades and above. Learning to see and knowing how to pronounce these recurring word parts (prefixes, suffixes and bases/roots), as well as small, already-known words, inside large, many-syllable words greatly enhances readers’ ability to tackle more advanced reading levels – particularly RL 4.0 and above. Teach your intermediate grade and above readers advanced decoding skills. Provide your students practice recognizing and pronouncing word parts in multisyllabic words. ★☛PLEASE NOTE: Words are NOT ALWAYS DIVIDED USING TRADITIONAL SYLLABICATION RULES! This program DOES NOT USE THE OPEN and CLOSED SYLLABLE METHOD or SYLLABICATION SEGMENTATION RULES to decode multisyllabic words. 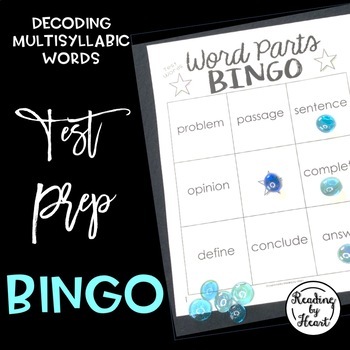 ★☛PLEASE NOTE: This is a DECODING activity, with emphasis on readers’ ability to decode longer, multisyllabic words encountered as their reading levels progress. Study of Word Part MEANINGS is a separate vocabulary skill and is NOT covered by this activity. ★This program’s focus is on ASSISTING STRUGGLING READERS to RECOGNIZE WHAT THEY ALREADY KNOW INSIDE A LONGER WORD. Thus, this process requires readers to break words into parts each reader recognizes. This may differ slightly from reader to reader, depending on the reader's prior knowledge. Thus, there may be more than one "right way" to break a word, since the goal of breaking a word is simply to help readers see chunks they recognize. Example: One reader might see "re" and "act" in the word "reaction," while another might notice "re" + "ac" + "tion" and another might simply recognize the word "act." In the word "fundamentally," one reader might see the word "fun" and another might recognize the word "fund." One might see "mentally" and another might see "ment" or "mental." Some might identify the word parts "al" + "ly" or the very common ending these two affixes make, "ally." All will help the reader decode the word more quickly. ★There are often multiple recognizable parts inside a longer word and sometimes two or more syllables are combined to increase the efficiency of the decoding process. (Example: the four-syllable word “in vis i ble” might be broken as “in vis ible” because the two syllables i+ble often occur together as ible (able, ible, ble and le) and can be taught together.) The goal is to lessen the number of letters and syllables a reader must decode in longer words. Some advanced “word parts” in this program (example: “istically”) are actually comprised of several syllables.